So, should you want or need this capability, here she is. Step 5: Send that baby! Step 7: It usually takes 2 – 15 mins of refreshing for the file to appear. Step 8: Once it does, click on the “Actions” dropdown next to the file name. – Personal encouragement. Just seeing your created words in that format can give you a dreamy, little boost. – I find errors that somehow remain invisible on both the hardcopy & computer screen. 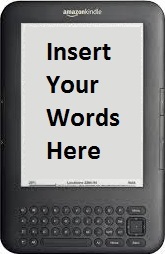 – Insert an image on the first page of the file & it will display as the book’s cover. – If your betas/CPs are comfortable with it, they can even authorize your email on their Kindle account & you can send it directly to them. They just have to pick up at Step 6 above. I’m curious about those of you who use programs other than Word or have different readers/apps. Do you ever use a similar process? Know of a quick cheat sheet to help others do the same? This entry was posted in Editing, Novel, Writing. Bookmark the permalink. I love doing this. It’s so much better than lugging around paper manuscripts. I use a slightly different method though: If you insert “free.” in in front of your email address (i.e. “free.youremail@kindle.com”) it will email you back a converted file so you don’t even have to hop over to Amazon, and you can just use your cable to upload it (and it doesn’t cost the 15 cents/MB or whatever Amazon charges to deliver it wirelessly). I find this easier. That is an awesome tip! Thx for sharing. I think the charge depends on whether you are using Wi-fi or are connected to the Whispernet thing. It might depend on the model. Nice! I was just wondering if I could do this the other day! Perfect timing, thanks! I’ve been downloading my ms into PDF master on my phone or ipad (but that tempts me to edit (-:). Those instructions have helped quite a few writers (and even an agent). Def seemed like a helpful thing to share.